Rare Yiddish Map of Israel, one of only 2 known examples. 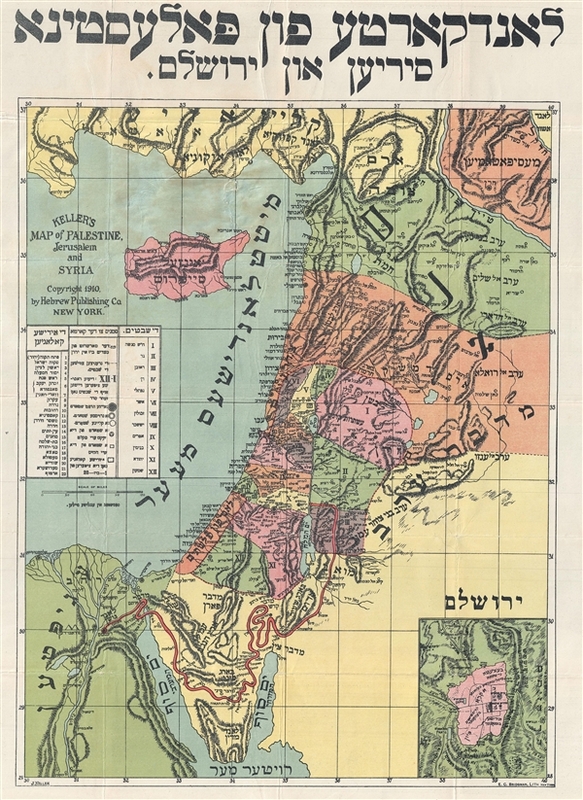 This is a rare 1910 Yiddish / Hebrew language map of Israel (Palestine / Holy Land) by J. Keller. The map covers roughly from Turkey to the top of the Sinai Peninsula and from the Nile Delta to Damascus. There is an inset of Jerusalem. Most text is in Hebrew but the title and copyright are also written in English. The verso contains illustrations of important Jewish figures and Jewish life as well as text in English. Drawn by J. Keller and engraved by E. C. Bridgman, lithographer, for the Hebrew Publishing Company of New York. The map appears to have been issued to celebrate the New Year. This map is quite rare with only one other known example housed at the National Library of Israel. Not identified in Wajntraub. Good. Backed on archival tissue. Minor wear on original fold lines. Minor damage where original attached to binder. Accompanied by original binder.